Jackson Dopp, 18, and his mother Jennie make cookies at their home in Layton. “I always wanted to make this recipe and just make it into one frozen candy bar for myself,” Jackson, 18, said. “Alright mister, that’s probably good,” his mom, Jennie, said, gently chastising her son. Wearing a faded Playstation t-shirt, the tall Layton High School senior put down his spoon, satisfied with the reserve cookie dough stashed in the freezer. Besides cooking, Jackson likes video games, especially one called Autcraft - a spinoff of Minecraft designed for people, like Jackson, diagnosed with autism. Jackson also has developmental disabilities due to a rare chromosome duplication called the 7Q11.23 duplication. His emotions peak about once a day, his mother said. For the Dopp family, Jackson’s mood has brought turbulence and triumph, their lives enriched by some experiences, drained by others. Emotional and physical exhaustion follow the constant meltdowns and behavioral outbursts. “You know, punching holes in the wall and screaming,” Dopp said. In search of relief from the unrest brought by that volatility — and concern about what adulthood might bring for Jackson — his parents have asked the state for help for years. The response: get in line. It’s a predicament faced by many Utah families with loved ones who have disabilities but few ways to get services like caregivers, transportation and after-school programs. Jackson is one of some 3,000 Utahns who have applied for state assistance from the Division of Services for People with Disabilities but are still waiting to receive job training, behavior support and other services. The state agency aims to make it possible for people to live in their communities, rather than institutions. But services, which are based on need, are not accessible for many — even though they’re in high demand. The waiting list for services has increased by 49 percent since 2015, according to records from the Division of Services for People with Disabilities. Officials don’t have a specific explanation why. Jackson has been on the waiting list for four years. The last time his mother checked he was No. 787. Others have been waiting for as long as 20 years, according to state officials. Services are provided for life, so the waiting list moves slowly. “So the reality is, Jackson will never, never get funded,” Dopp said. But that reality could change this year. State Rep. Norm Thurston, R-Provo, is working on a proposal for $6 million in ongoing yearly funding that would allow around 900 people to receive services. That’s about triple the number funded in a typical year. Officials at the Governor’s Office of Management and Budget attribute the funding increase to the state’s $1 billion budget surplus. Thurston said in an interview that while there is a finite amount of money to fund a finite amount of needs, legislators have found a way to stretch that money and help more people — faster. A member of the House social services appropriations committee, Thurston said every year the Legislature adds funding and every year the waiting list gets longer, resulting in what he calls “legislative fatigue.” He’s pushing for the issue to stay high on the legislative agenda this year. “I’m just not sure why this has not been a higher priority consistently over the years,” he said. It’s a question some disabled Utahns and their parents have struggled to answer. In many cases, they have serious disabilities, but not severe enough to land at the front of the state’s waiting list. “How many people the system can serve depends on how much money the Legislature has provided to the system over time,” said Andrew Riggle, the public policy advocate for the Disability Law Center, a Salt Lake City-based legal advocacy organization. Andrew Riggle, public policy advocate with the Salt Lake City-based Disability Law Center. 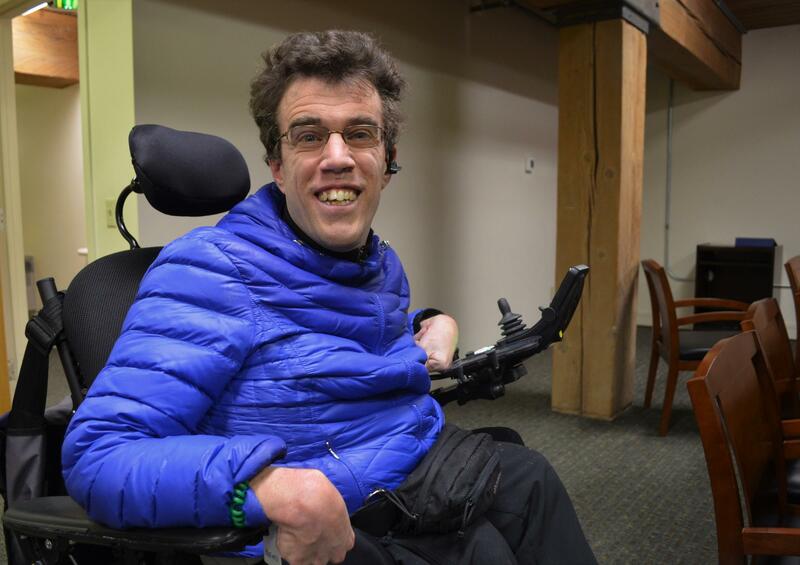 Riggle, who has cerebral palsy, became active in disability advocacy in 2006 while trying to get full funding for those on the state’s disability waiting list. The competition over scant resources comes from how much the Legislature has chosen to fund the program, he said. While Jackson’s family is financially comfortable and has health insurance, many of the specific services he needs aren’t available anywhere else, his mom said. “Obviously, we have what we need. It’s just that we don’t have the things that will help Jackson. And I can’t get those for him without being allowed to participate,” Dopp said. Currently when an individual gets to the top of the waiting list they have access to a suite of support services, which come through Utah’s Medicaid program. The new proposal would incorporate a “limited supports waiver” to let the state target specific services to meet individual needs, such as after-school assistance or short-term caregiver help, known as respite care. “There’s really no limit about how helpful something such as respite, additional behavior supports, transportation after school, those really can be life changing for people who currently don’t have access to those resources,” said Joey Hanna, executive director of the Utah Parent Center, a Salt Lake City-based resource center for parents of children with special needs. Hanna said accessing these services earlier can prevent an individual’s condition from worsening, and can reduce the stress on the families of disabled people. “If you can take a minute and think about just going on a date with your spouse, yet you have a kid who is extremely medically fragile with significant disabilities,” Hanna said. Jackson will graduate from high school in June. That could mean a whole new set of challenges. Or it could mean a new level of independence if he gets the tools he needs, his mom said.